This the story of an astonishing life told in her own words. Maria Botchkareva (whose nickname was Yashka) was not only a soldier in the Russian Army who fought in combat during the First World War, she was also the first woman to command a military unit in the Russian Army. Born a peasant, Yashka left home at 16 years old, coerced into prostitution and tramped into exile on foot following her abusive criminal lover. 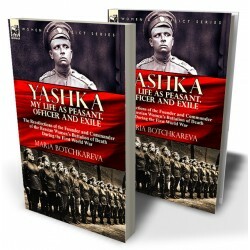 When the First World War broke out in 1914, Yashka then age twenty-five and motivated by national pride, attempted to join the army. Although she was initially rejected she was eventually accepted following the intercession of the Tsar. Sent to the front Yashka was decorated for rescuing fifty wounded soldiers from the battlefield and was wounded herself several times. In 1917 she proposed the creation of an all-female combat unit which would not only fight, but provide inspiration for the flagging morale of male Russian troops at that point in the war. This eventually gave rise to the creation of the incredibly titled 1st Russian Women’s Battalion of Death. The unit served on the Russian Western Front where once again Yashka was wounded in action. Botchkareva’s inspirational initiative attracted international attention and she was visited by Emiline Pankhurst, the political activist and suffragette who proclaimed her ‘the greatest woman of the century’. By this time Yashka was associating herself with the White Russians and had been placed on a Bolshevik ‘death list’, the fatal consequences of which she narrowly escaped, making her way to the USA where she pleaded with President Woodrow Wilson to aid Russia in its time of need. She was also granted an audience in Britain with King George V. Yashka returned to Russia, was eventually captured by the Bolsheviks and against Lenin’s orders shot by the Cheka as an ‘enemy of the state’ in 1920. All day the artillery boomed again, as violently as the previous day. At night, our ranks refilled with fresh drafts, we climbed out again and rushed for the enemy. Again, we suffered heavily, but our operation this time was more successful. When the Germans saw us push determinedly on in their direction they came out for a counter-attack. With bayonets fixed and a tremendous “Hurrah,” we bounced at them. The Germans never did like the Russian bayonets. As a matter of fact, they dreaded them more than any other arm of warfare, and so they gave way and took to their heels. We pursued them into their trenches, and there followed a hot scramble. Many of the Germans raised their hands in sign of surrender. They well understood that we were in a fierce, exasperated mood. Others fought to the end, and all this time German machine guns swept their own trenches, where Teuton and Slav were mixed in combat. We rushed the machine gun nests. Our regiment captured in that attack two and a half thousand Germans and thirty machine guns. I escaped only with a slight bruise in the right leg and did not leave the ranks. Elated by our victory over the strong defences of the first line, we swept on toward the enemy’s second line. His fire slackened considerably. A great triumph was in prospect, as behind the weak second and third lines there was an open stretch of undefended territory for many versts. Our advance line was within seventy feet of the enemy’s trenches when an order came from General Walter to halt and return to our positions. Men and officers alike were terribly shocked. Our colonel talked to the general on the field telephone, explaining to him the situation. The general was obdurate. All of us were so incensed at this treacherous order that, had any one of us taken charge at the moment, we would undoubtedly have snatched a great victory, as the breach in the German defences was complete. The conversation between the colonel and general ended in a quarrel. The general had not, apparently, expected us to break through the first German line. So many waves of Russian soldiers had beaten in vain against it, and with such terrific losses. As our men saw it then, it was the general’s traitorous program to have as many of us slaughtered as possible. But discipline was rigid, and orders were orders. We had to go back. We were so exhausted that our bodies welcomed a rest. In those two days, the 7th and 8th of August, our ranks were refilled four times with fresh drafts. Our casualties were numberless. Like mushrooms after a rain the corpses lay thick everywhere, and there was no count to the wounded. One could not make a step in No Man’s Land without striking a Russian or German dead body. Bloody feet, hands, sometimes heads, lay scattered in the mud. That was the most terrible offensive in which I participated. It went down into history as the Battle of Postovy. We spent the first night in the German trenches we had captured. It was a night of unforgettable horrors. Darkness was impenetrable. The stench was suffocating. The ground was full of mud-holes. Some of us sat on corpses. Others rested their feet on dead men. One could not stretch a hand without touching a lifeless body. We were hungry. We were cold. Our flesh crawled in the dreadful surroundings. I wanted to get up. My hand sought support. It fell on the face of a corpse, stuck against the wall. I screamed, slipped and fell. My fingers buried themselves in the torn abdomen of a body. I was seized with horror such as I had never experienced, and shrieked hysterically. 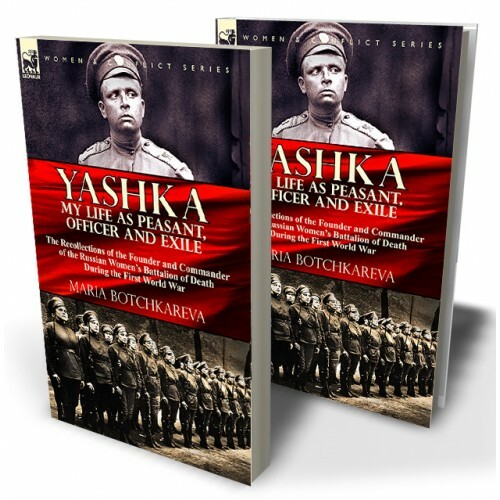 My cries were heard in the officers’ dugout, and a man was sent for me with an electric hand light to rescue Yashka, whom they had taken for wounded. It was warm and comfortable in the dugout, as it had previously been used by the enemy’s regimental staff. I was given some tea, and little by little regained my poise. The entrance of the dugout was, naturally, facing the enemy now. He knew its exact position and concentrated a fire on it. Although a bombproof, it soon began to give way under a rain of shells. Some of these blocked the entrance almost completely with debris. Finally, a shell penetrated the roof, putting out the light, killing five and wounding several. I lay in a corner, buried under wreckage, soldiers and officers, some of whom were wounded and others dead. The groans were indescribable. As the screech of a new shell would come overhead I thought death imminent. There was no question of making an immediate effort to extricate myself and escape while the bombs came crashing into the hole. When the bombardment finally ceased with dawn, and I was saved, I could hardly believe my own senses that I was unhurt.